When I switched jobs in December (not related to mobile industry at all, BTW), I was presented with the dreaded question “which Nokia E-series phone would you like to have?“. Having lived without a Nokia phone for years, the thought of returning back to the non-touch S60 world was simply unbearable and literally made me feel sick in the stomach. There was absolutely nothing in the Nokia business phone catalogue that I wanted to carry in my pocket. To buy off some time, I asked if I could wait for the Nokia E7 release that was just around the corner. My employer agreed and I just continued using my personal Samsung device, powered by Android. 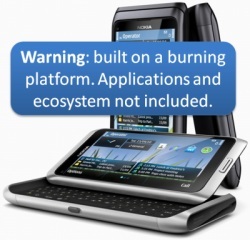 As it ever so often happens with Nokia product launches, E7 got delayed into Q1/2011. I ended up upgrading my personal Android device to HTC Desire HD (words cannot describe how much this thing rocks, but that’s another story). On Monday, February 7th, Nokia E7 finally started shipping in limited quantities to the Finnish resellers. The company representatives were calling it “the most important model this year” in terms of sales expectations. On friday, February 11th, the device was as good as dead. Why? Because Nokia pulled the plug on Symbian, as illustrated on the following slide. Regardless of this fact, Nokia is still expecting to sell 150 million Symbian devices before the game is over. Hmmm… okay… and how exactly do you plan to trick people into buying them? If you’re shopping for cars, it’s perfectly justified to buy a 2011 model that you know is going to be soon superseded with a 2012 model. Typically you get a sweet deal with accessories, plus there’s unlikely to be too many “bugs” and product recalls for a proven model. It’s not going to work quite like that in the mobile industry. Nokia E7 is surely a beautiful piece of hardware design and component engineering, built with the decades of expertise accumulated into Nokia’s organization for producing the best mobile phones out there, delivered through the most efficient logistics chain in the business. Unfortunately it is now merely an empty shell with a “burning platform” inside it. I wish there was a quick way to flash the operating system of E7 from Symbian^3 to Windows Phone 7. But as always, if it was easy, the Chinese would have already done it. E7 may still be a viable option for the oldskool business crowd who just want a replacement for their existing Nokia Communicator, primarily for phone calls, calendar and email. But if that’s all you wanted, then why did any of the Symbian engineers bother coming to work in the morning for the past 5 years? I hate to be the one breaking this to you, but getting a touch screen device with built-in support for Facebook widgets will not be enough to show you what’s really going on in the ecosystem of today’s mobile applications. You still won’t understand what all the cool kids are doing with their mobiles. You won’t see the business opportunities until your iPhone using competitor shows them to you. If you can’t be one of the cool kids at the school yard, then try and be one of the smart kids instead. You probably won’t gain overnight popularity, but you may end up making a nice living eventually and getting your revenge. While the iPhone is certainly no one hit wonder á la Razr, there is no proof yet that Apple (or Google) would have secured their position as the U2 of mobile phones, forever entitled to sold-out stadium gigs and undivided attention from the media. Android is aimed almost exclusively at disrupting the dominance of iOS, which means Apple and Google are fighting for the same market position. Sure, their approach is different in many ways (closed system vs. open source, for example) and Android is reaching towards the lower end of the market where iPhones are not even intended to be an option (remember, that’s where Symbian was supposed to go and retire). Windows Phone 7 is in such early phases of its existence that the platform doesn’t yet have a clear identity of its own and it is therefore being typically described through comparison to iOS and Android. This approach is ignoring the key focus areas where WP7 does differ from the established players: business users and .NET developers. Ask a corporate IT department about which platform they want to be supporting and it’s a case of choosing a lesser evil from iOS or Android. Both of them are prime examples of the consumerization of IT. People like me will no longer tolerate standardized hardware from our employers, we’ll just rather bring our own devices to work. The problem with the cool gadgets that are capturing the attention of geeks and consumers alike is that they have been designed specifically to YOU. You as a single person, who makes the single decision to buy. The needs of a group of people encapsulated inside an organization such as a corporate office are quite different. Security, administration, compatibility and all those boring aspects are actually quite crucial to delivering monetary results beyond personal satisfaction. The mobile platforms of the future will have to be a working compromise between usability and manageability. This is where Microsoft is ahead of Apple or Google, who don’t truly know how to operate in the business segment. Nokia also has some very relevant experience from trying to meet the needs of business users and should therefore be well positioned in formulating a winning strategy to get both the IT managers and the Outlook junkies to ask for WP7 devices. Some say Microsoft is a dying consumer brand. There’s a hint of truth in that, since the world of personal computing has been moving away from the traditional PC desktops, into cloud apps provided by the likes of Google, and more personal mobile devices like the iPhones and iPads. Microsoft is clearly a runner-up in both categories. At the same time, they do have an impressive record of charging against Nintendo and Sony with their Xbox 360, which shows they are not planning to become a purely business brand anytime soon. It would also be a mistake to assume that Microsoft is forever stuck on the desktop, as they are building a huge “platform in the cloud” offering as Windows Azure and all the related Online Services brands. Sure, Gmail beat Hotmail with ease, but it doesn’t look like Google Apps would be walking over Microsoft’s cloud-enabled Exchange/SharePoint offering quite yet. Microsoft’s “all in” cloud strategy is going to provide a highly credible portfolio of productivity apps to Nokia’s WP7 devices, certainly much more than they could have ever built on their own or acquired through weak partners like Yahoo. 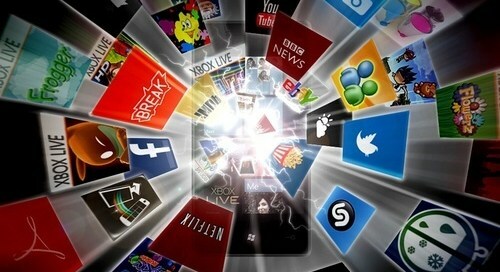 Like Mr. Scoble put it in his blog post on the Nokia WP7 alliance, “apps are the ONLY thing that matters now”. If that statement holds true, then the producers of those apps are the ones whose interest you need to capture on day one. Yes, you know this one, so sing along with me: “Developers! Developers! 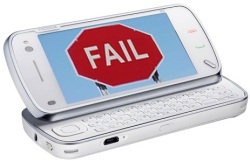 Developers!” If Symbian was the most hostile development environment for mobile phones ever invented, then judging by the initial launch strategy of Windows Phone 7, it’s the complete opposite. Not only is Microsoft altogether making massive investments into its developer toolkits, the promise of easy application portability across mobile, desktop, console and browser environments must sound more tempting than learning to develop apps for yet another mobile platform that promises to be something big, one day, maybe. The world is full of .NET developers who Microsoft and Nokia can target to persuade them to extend their applications onto the closest possible mobile platform, which just happens to be WP7. 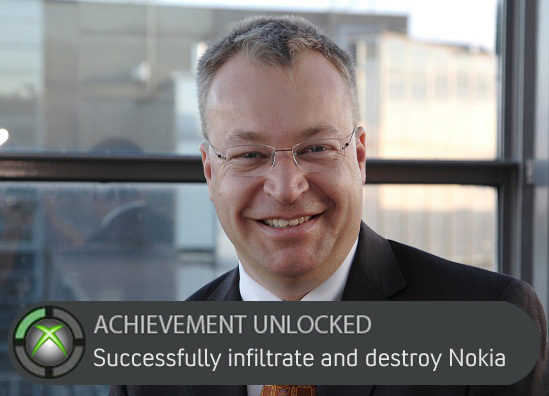 We all know the facts: Microsoft is not cool, Nokia is not cool. When put together, they will indeed look like a pair of turkeys initially. They will take a fair amount of beating after class from the tech blogger bullies and gangs of Android geeks from all over the globe. Nevertheless, once we get over this initial reaction and start seeing physical results from the partnership, there’s a very real chance that both Microsoft and Nokia will be stronger together than what they could have been on their own, without admitting their past failures. There is a dark shadow looming behind the partnership, as Microsoft’s previous mobile partners have not really fared all too well after teaming up with Redmond. 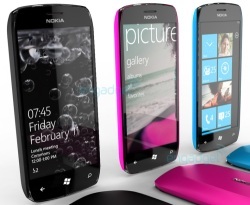 It may well turn out to be a similar bust for Nokia, only time will tell. Even though it’s clear that Nokia has a lot more at stake in the deal than Microsoft, it’s getting more and more embarrassing for Microsoft not to have a credible presence in mobile devices. While Microsoft has never been too great at new product innovation, they’ve proven time and again their ability to muscle into a maturing market. Let’s see if they mean business this time around.